ROME (AP) — A black Italian athlete was wounded in the eye when an egg was hurled at her Monday, the latest of at least nine attacks since Italy’s anti-migrant government took power that are being investigated as possible acts of racism. Asylum-seekers, legal immigrants and others who aren’t ethnic Italians are among the people injured since early June. They include a 13-month-old Roma girl who was shot while she was in her mother’s arms on a Rome street and left partially paralyzed. The egg thrown Monday hit discus thrower Daisy Osakue, who was born in Italy to Nigerian immigrant parents. Osakue holds Italian citizenship and was expected to compete for Italy in the European Athletics Championships next week. 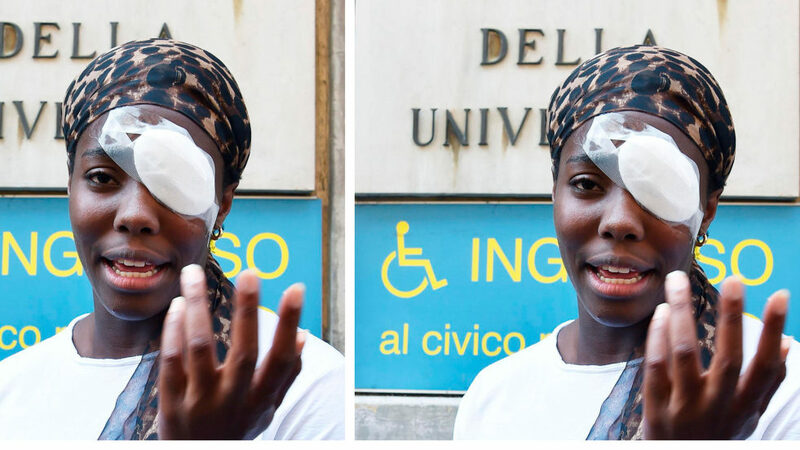 Emerging from a clinic with a bandage over her left eye, Osakue said she thinks she was mistaken for one of the African prostitutes who often work the street on the outskirts of Turin she was crossing. The athlete, who is also a sprinter and hurdler, said she saw a car speeding toward her while she was in a crosswalk and dashed to the sidewalk to avoid the vehicle. She recalled feeling something strike her eye and falling forward. “I’m sorry to say it, but I think we’re dealing with racism,” Osakue, who currently trains and studies criminal justice in the U.S. state of Texas, told Italian TV. Her ability to compete in the track-and-field championships is uncertain because eggshell fragments injured her cornea. Police were investigating to determine if it was a racially motivated attack. In the case of the Roma child, police concluded she was shot by an air gun that an Italian man fired from his balcony. The man denied targeting Roma people, saying the pistol misfired while he was trying to adjust it. Salvini campaigned for the March 4 election with the slogan “Italians first” and accused migrants of robbing Italians of work. His party is soaring in Italian opinion polls. Opposition leader Maurizio Martina, who heads the center-left Democratic Party, called on Salvini and his allies to denounce the “racist spiral” of violence. “They are accomplices” if they don’t, Martina said. The incidents causing worry have occurred throughout Italy, from north to south. A Cape Verde man with a residency permit was shot in the back on July 26 while working on scaffolding to set up decorative lighting for a town celebration in Italy’s northeast Veneto region, a stronghold for Salvini’s party. Police said the shot came from a pellet rifle fired from a private terrace. A man told investigators he was aiming at a pigeon. Near Naples on July 20, two youths allegedly shot a 22-year-old cook from Mali who has lived in Italy for four years. A young man from Senegal was kicked and punched last week by three Italians at a cafe where he worked in Sicily. Osakue, in an interview with the Italian news agency ANSA, referred to right-wing political rhetoric targeting foreigners. “They have very strong power of influence on mass media,” she said. “So if they say ‘it’s their (the migrants) fault, they steal our jobs, they come here and they destroy everything … obviously people will start thinking that they are right,” she said. Shortly before the March election, a right-wing Italian extremist who once ran for local office for Salvini’s party allegedly shot and wounded six Africans in drive-by shootings in the town of Macerata. The suspect has reportedly said he was angry over the slaying in Macerata of an 18-year-old woman whose body was hacked into pieces. A local Nigerian drug dealer was arrested in the murder.